COP23 President and Fijian Prime Minister Voreqe Bainimarama delivers his remarks at the COP 24 meeting. 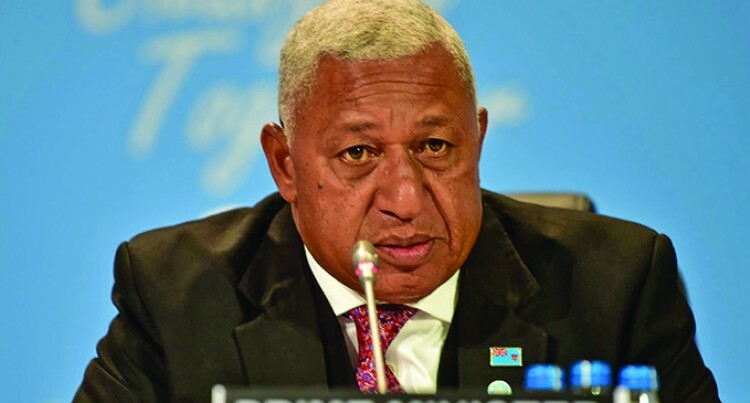 Prime Minister Voreqe Bainimarama has told COP24 that Fiji’s commitment to climate action is total and absolute. “It is at the core of our national policies and our medium and long- term development plans,” he said. He was delivering Fiji’s statement at Katowice, Poland. He said the plans involved mitigation and adaptation initiatives across a broad front. “As I said in my handover statement this morning, Fiji has become one of the first two nations to commit to raising the ambition of our NDCs by 2020 and to reach net zero emissions by mid-century. And we are appealing to all nations to do the same,” he said. “So my government has approved a Low Emission Development Strategy that will make us the 11th nation to have submitted such a plan to the UN in line with Article 4 of the Paris Agreement. “This strategy is ambitious, inclusive and comprehensive, with a broad range of initiatives that promote sustainable growth and long- term decarbonisation of the Fijian economy. A major area of focus is the energy sector and achieving reductions in carbon emissions in land transport, maritime transport and domestic aviation. Mr Bainimarama said Fiji had also formulated its first ever National Adaptation Plan to boost our resilience to the climate threat. “We will also be launching this plan at COP24 next week,” he said. “This involves a continuous and progressive process to ensure a systematic and strategic approach to adaptation in all government decision-making. We are placing a particular emphasis on agriculture, fisheries, biodiversity, health and a range of adaptation action in all of our communities, from our cities to small rural and maritime communities. “These range from building sea walls and relocating communities threatened by rising seas to strengthening our infrastructure through improved building codes to withstand the extreme weather events that are becoming more frequent and intense. “While our formal presidency of the COP negotiations has come to an end, Fiji is determined to be at the cutting edge of the fight against climate change. We have some of the most progressive policies to deal with the climate threat but, of course, we will need the assistance of our development partners to put them into practice. “So I again urge the global community to make a renewed effort to free up the many billions of dollars that the climate- vulnerable will need to confront the scale of the challenge we face.